Surprise your loved ones in all cities in India by sending them this basket filled with 25 peach Gerberas. The arrangement is made attractive with green leaves and ribbons. You can be sure that the recipient will be thrilled to receive this from you. 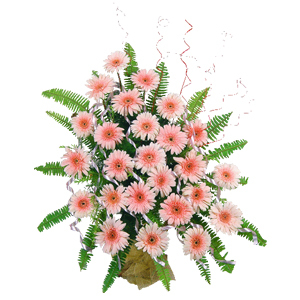 Moreover, you can also send this beautiful arrangement along with other Gifts across India through GiftsAcrossIndia.com.